St. Paul’s Lutheran Church (ELCA) – A Christ-centered community, striving to make our faith active in love to all. This is who we are. Through our faith in Jesus Christ, we welcome anyone who wants to grow in their relationship with God through Jesus Christ. To strengthen our faith, we worship together on Saturday afternoons and on Sunday mornings. To grow in faith, we encourage Christian education and service to the community and congregation. The outcome of our faith is our love for one another and for all of God’s people in our community and world. Come, and help us share the love of Christ with others. St. Paul’s had its beginning on June 11, 1906. At this first meeting of organization, a constitution was adopted. The first service was held at the Waterloo City Hall on July 1, 1906. On August 26th, 41 charter members celebrated communion, elected the first council, and installed Rev. A. C. Peterson as their pastor. Land was purchased in 1908 and a church was built, which was dedicated in 1909. Seminary students served the congregation from November 1909 until June 1911. Pastors serving from June 1911 to September 1928 included C.P. Weiskotten, E. T. Finck, J. M. Ramsey and C. A. Kipps. In December 1928, the Rev. F.O Broesicke became pastor. The decision to remodel was made in 1930. The Women’s Missionary Society presented the gift of a new organ which was dedicated with the church. In 1945, the interior of the church was decorated. The Rev. Louis Piehl served at St. Paul’s from 1947 until 1952, when the Rev. Leroy Futscher assumed the pastorate until 1955. The Rev. Donald Wandersee became pastor in 1956 and in September the congregation celebrated its 50th anniversary. The property adjacent to the church was purchased in 1961. Kenneth Walstrom became pastor in 1963. In 1964, the present parsonage was built and dedicated. The Rev. Gerald Goodrich became pastor in 1967. In 1972, the interior of the church was extensively remodeled, an addition was added and the parking lot was constructed. Rev. James Kannenberg served the church beginning in 1976. In June of 1981, the 75th anniversary of the church was celebrated. From August 1987, through August 1989, St. Paul’s was privileged to have two seminary students as interns: James Bump and Mark Bartusch. A new parking lot was added to the south end of the church in 1988. Special services were held on May 15, 1988, to help Pastor Kannenberg celebrate 25 years in ministry. The 85th anniversary was held in 1991. Pastor Kannenberg retired in 1998. 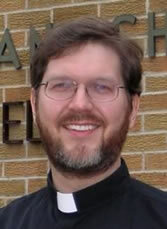 In 1999, Pastor Robb Kosky came to St. Paul’s. A building project with a new entry to the back and remodeling in the basement took place in 2002. In 2005, remodeling was done to the upper level of the narthex and nave. We celebrated our 100th anniversary in 2006, and we continue to grow in love and faith.